Go back to Part 4. 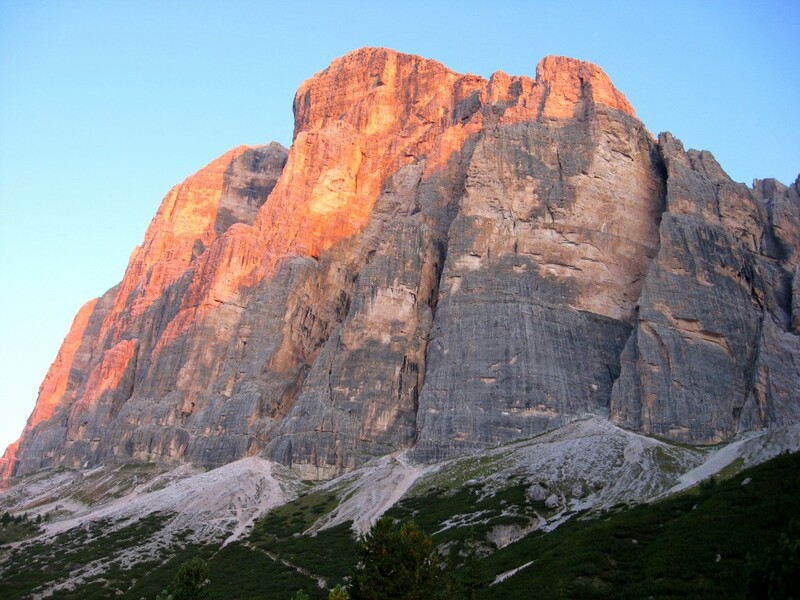 South face of Tofana Di Rozes. 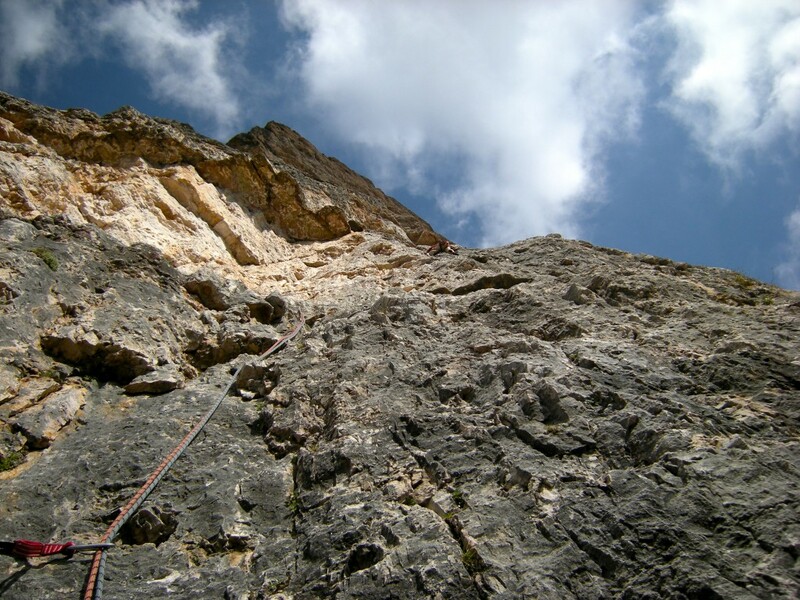 The 18-pitch Costantini/Ghedina route (a.k.a. 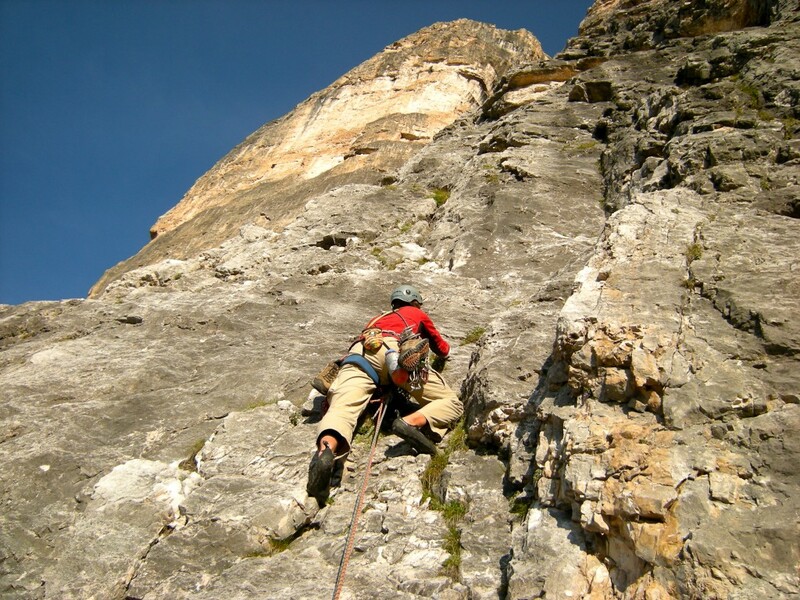 Pillar Rib) climbs the second prominent buttress from the right staying close to the arete (Aug. 2008). 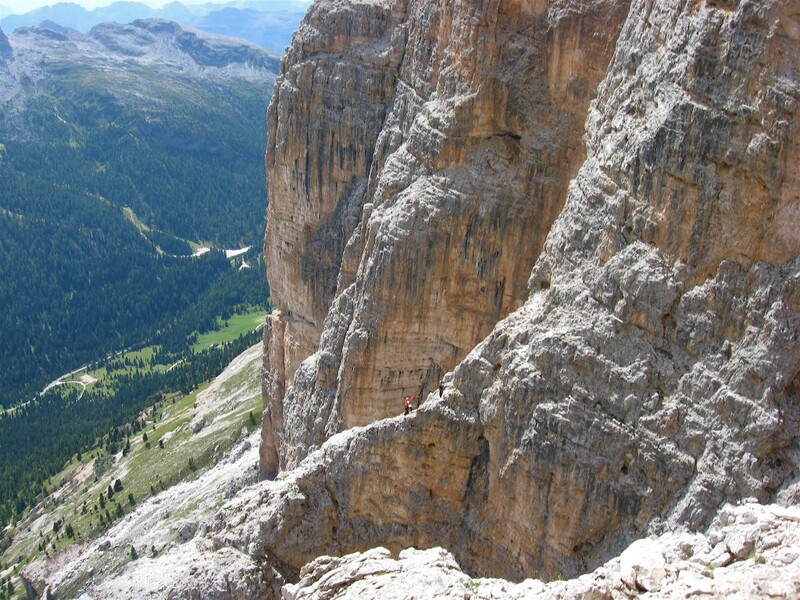 Buttress Two of the south face of Tofana Di Rozes. 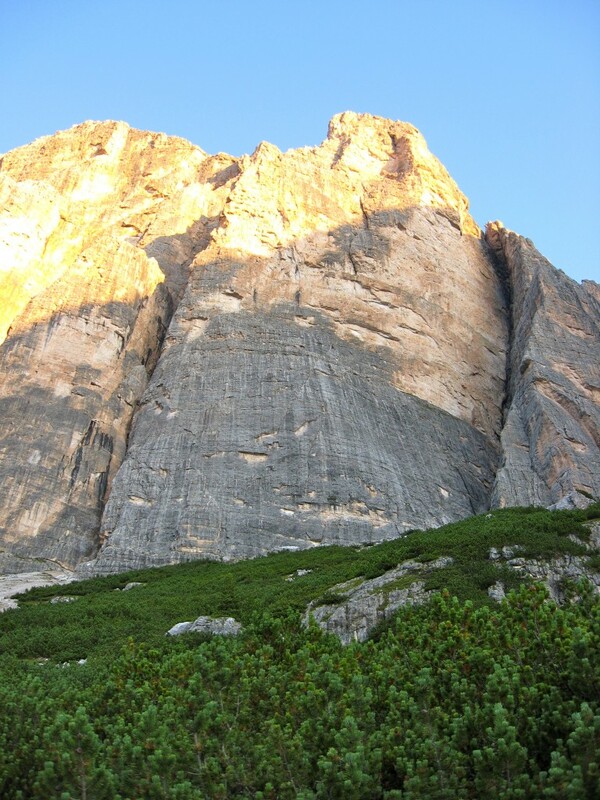 View is from our morning approach to the start of the Pillar Rib route (starts near the left edge of the buttress; Aug. 2008). 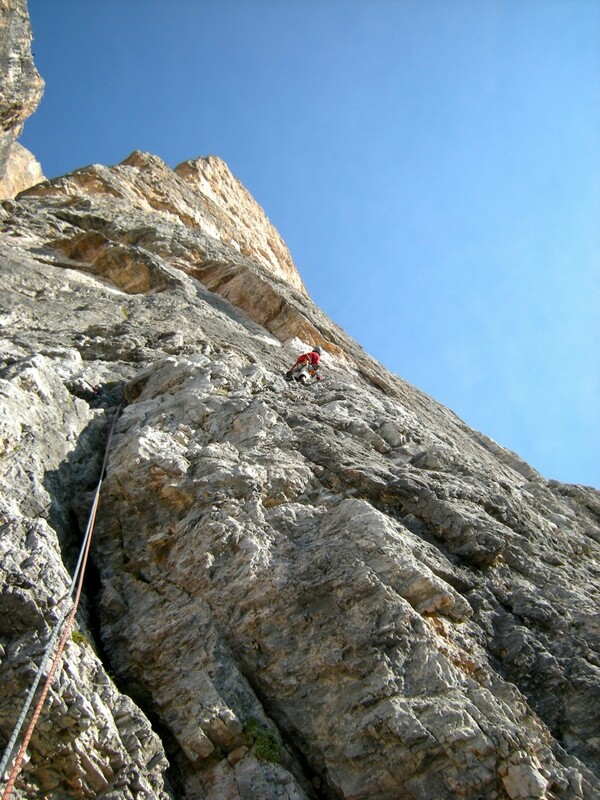 Starting up the 18-pitch Costantini/Ghedina (a.k.a. 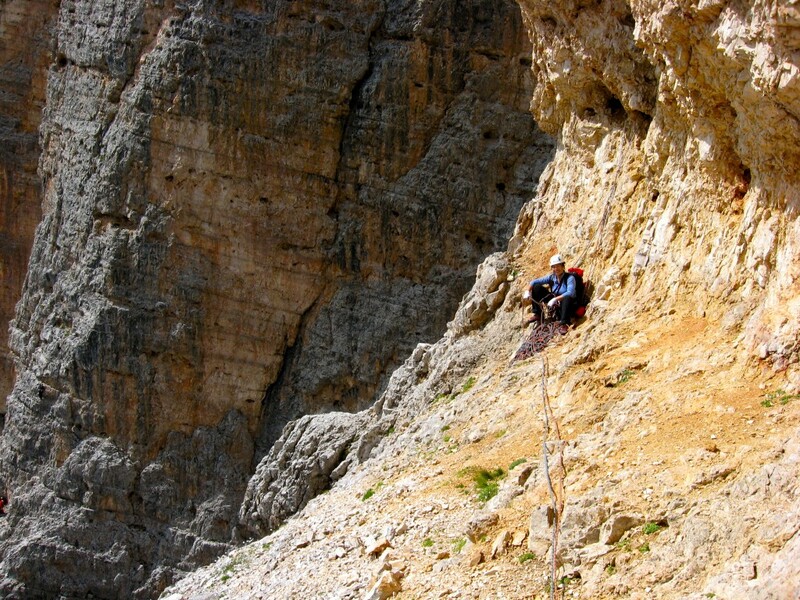 Pillar Rib) route on Tofana’s Buttress Two (Aug. 2008). 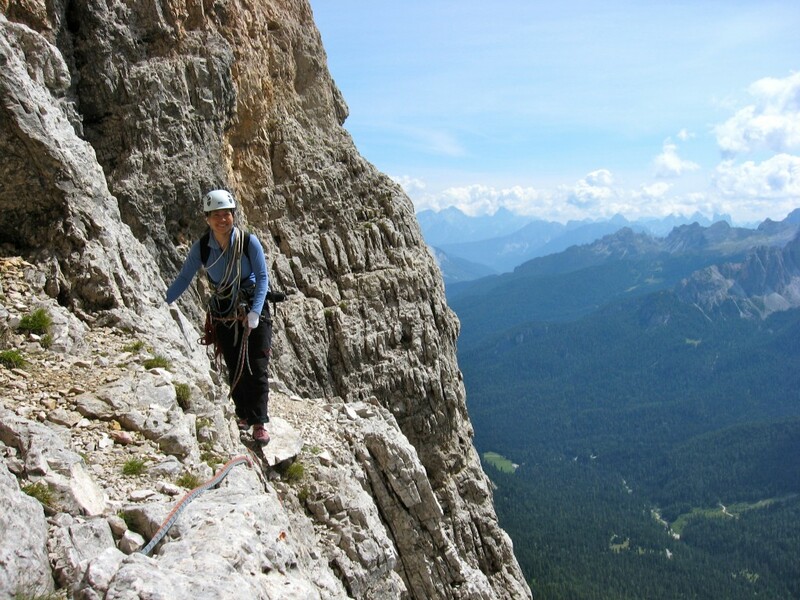 Shirley nearing the top of pitch 2 (we combined 1 and 2) of Costantini/Ghedina. 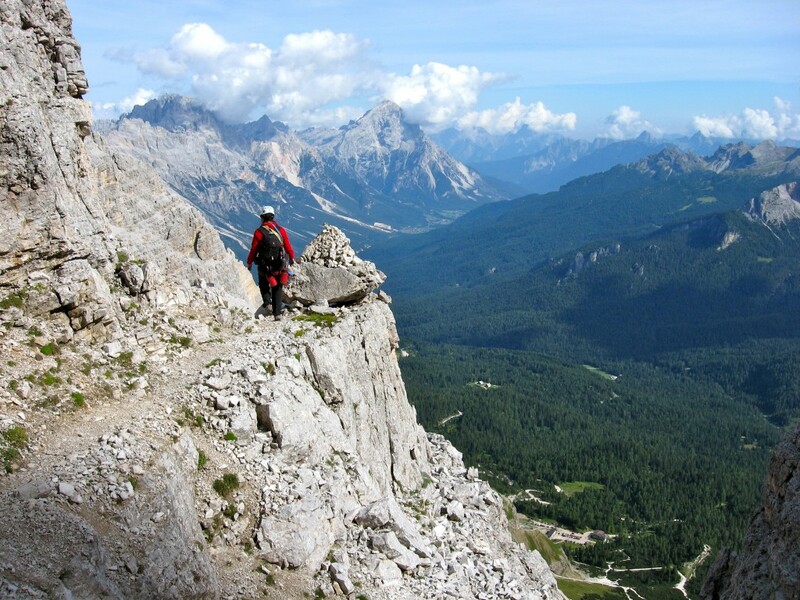 An Austrian team is below us (Aug. 2008). 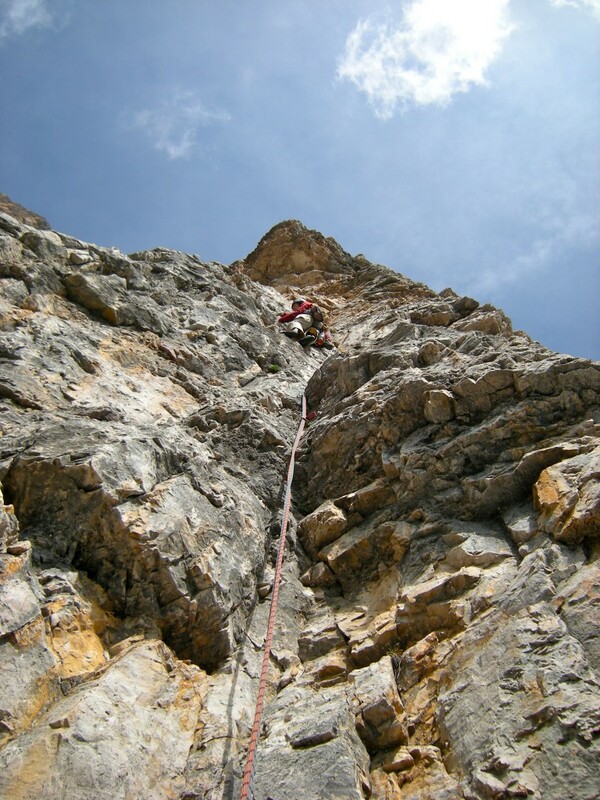 Leading pitch 3 of Pillar Rib with the rest of Buttress Two towering above (Aug. 2008). Shirley on pitch 3 traverse on the Pillar Rib route on the Second Buttress. Third Buttress is in the background (Aug. 2008). 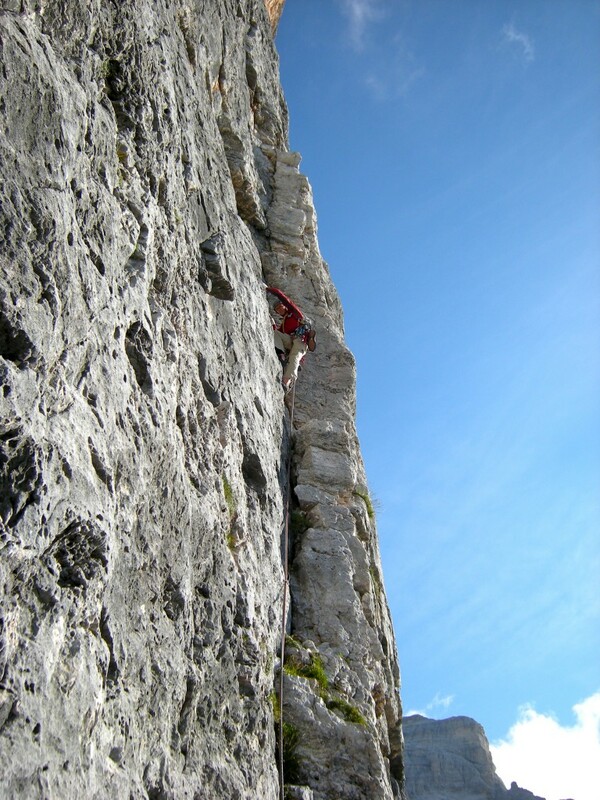 Leading pitch 4 of Pillar Rib – up the dihedral before cutting back left onto the face above (Aug. 2008). Leading pitch 5 (which we combined with the previous one) of Pillar Rib (Aug. 2008). 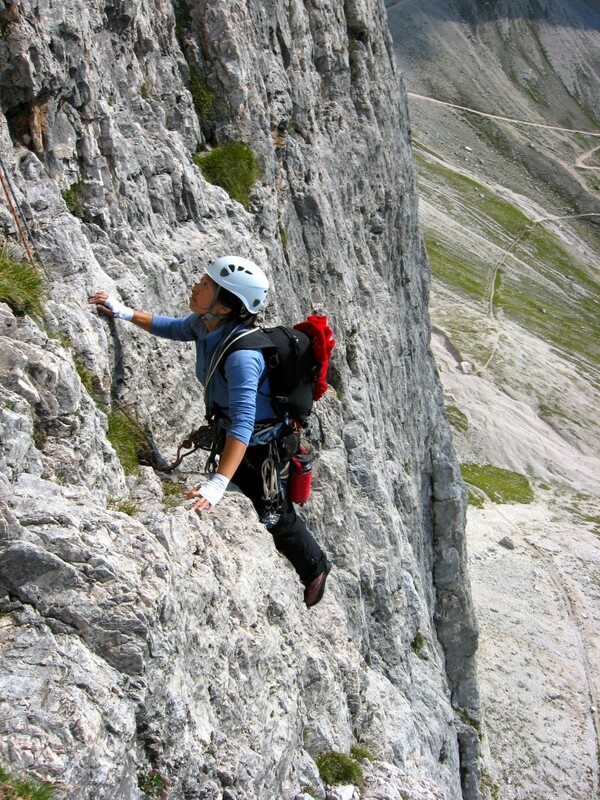 Shirley on pitch 5 of Pillar Rib (Aug. 2008). 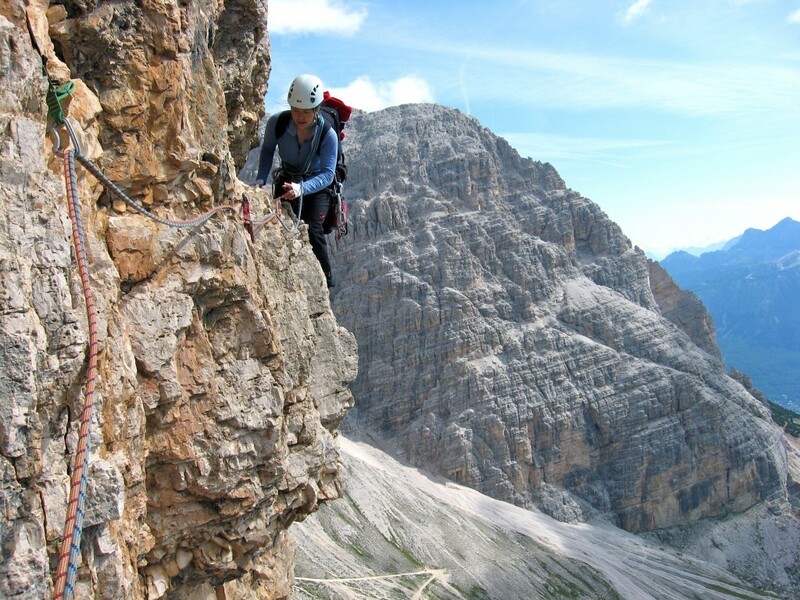 Shirley nearing the top of the 5th pitch of the Pillar Rib on Tofana (Aug. 2008). 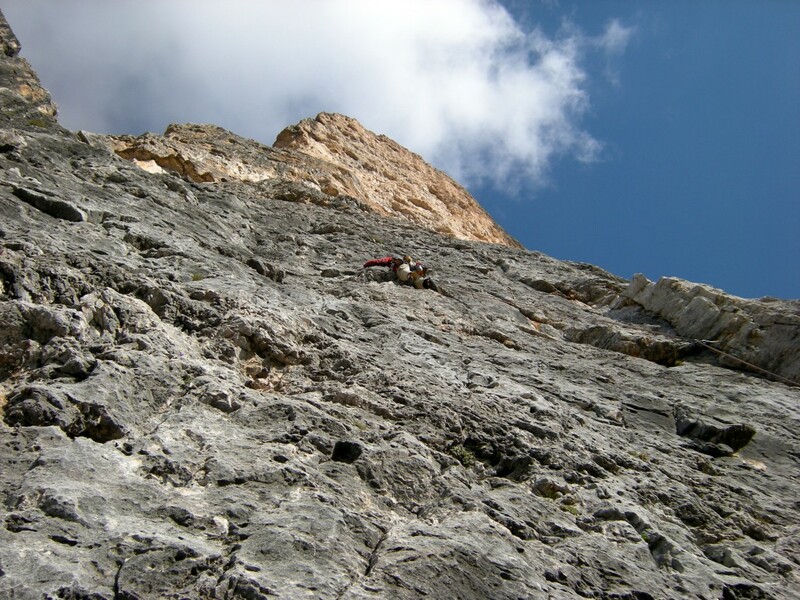 Unknown climbers high on the Third Pillar of Tofana di Rozes (I think! August 2008). 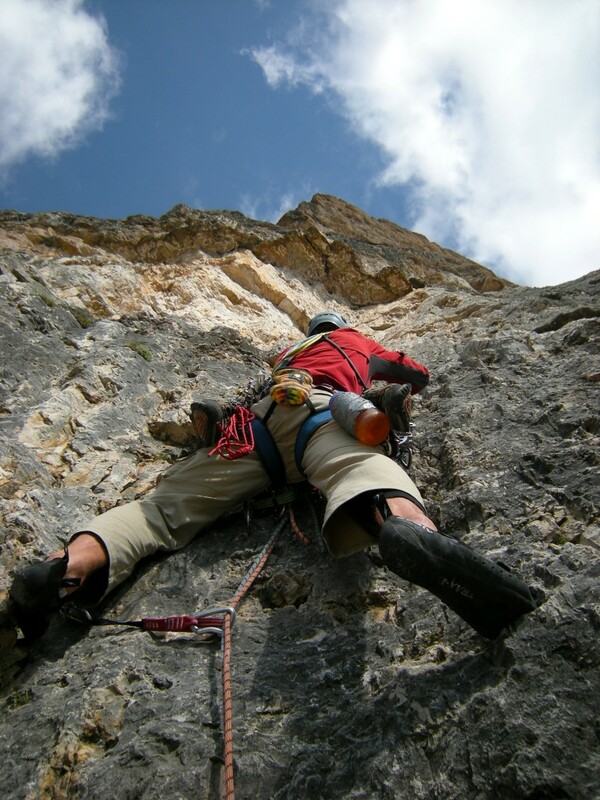 Starting the lead of pitch 7 (first VI- pitch) of the Pillar Rib (Aug. 2008). Higher on the same pitch. The next pitch traverses sharply left from there (Aug. 2008). 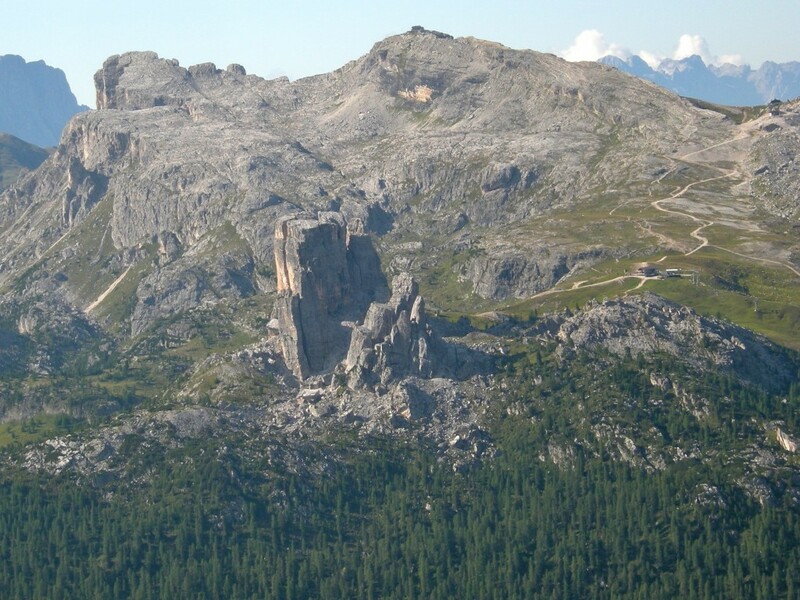 Looking back towards the Cinque Torri group across the valley (Aug. 2008). 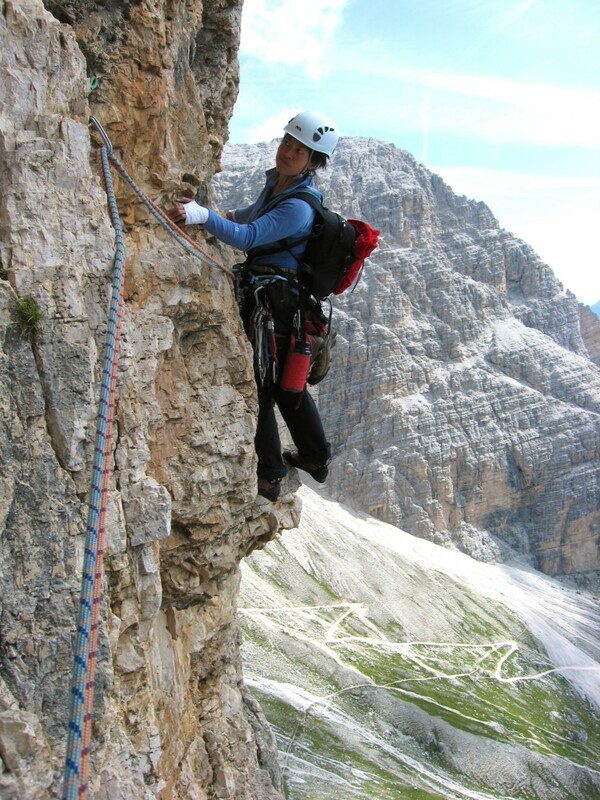 Shirley on the 8th pitch traverse (VI-) on the Pillar Rib route of Tofana Di Rozes (Aug. 2008). 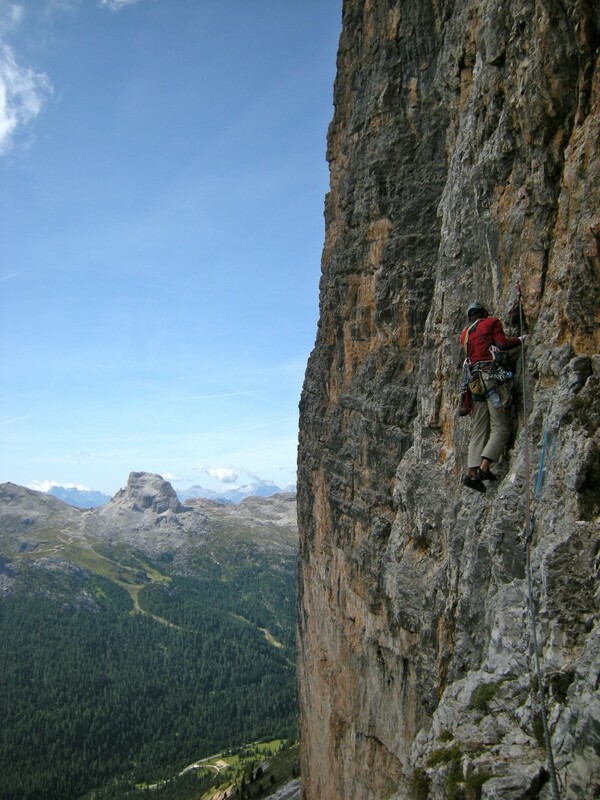 More of the same cool traverse pitch (Aug. 2008). Leading on one of the upper pitches (9th? 11th?) of the Pillar Rib (Aug. 2008). 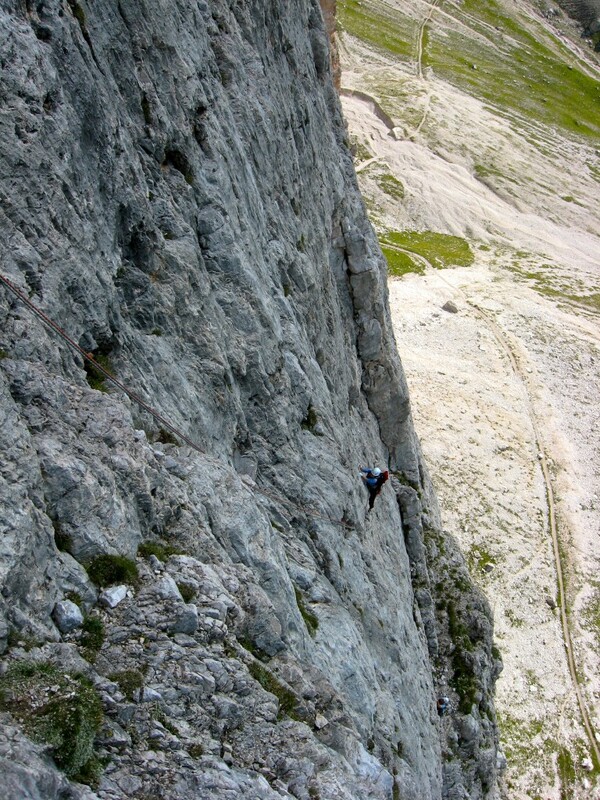 Shirley on 10-ish pitch of Pillar Rib. 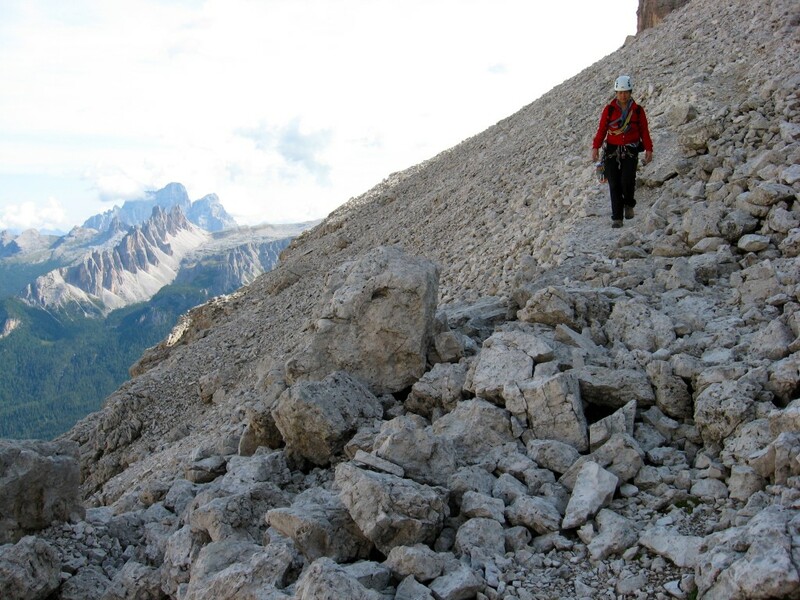 This is where the route changes sides on the giant arete (Aug. 2008). 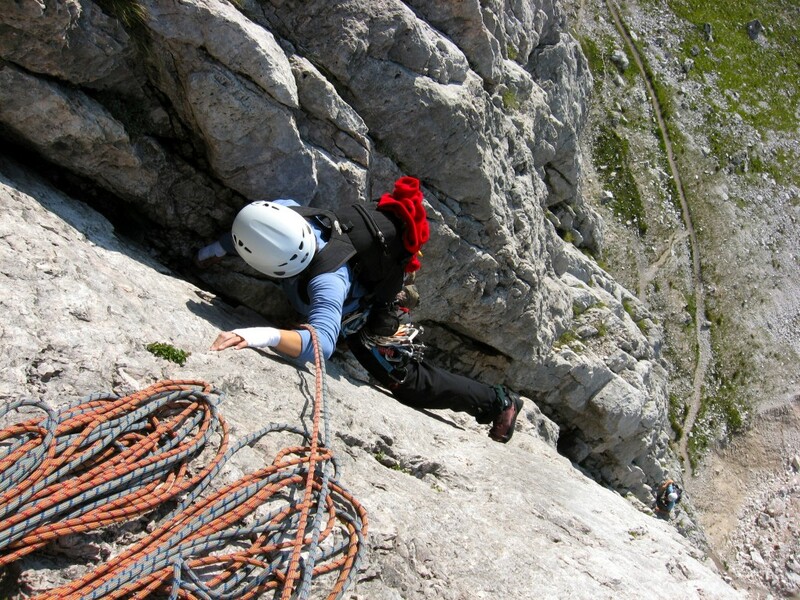 Shirley topping out on pitch 14 of Pillar Rib (Aug. 2008). 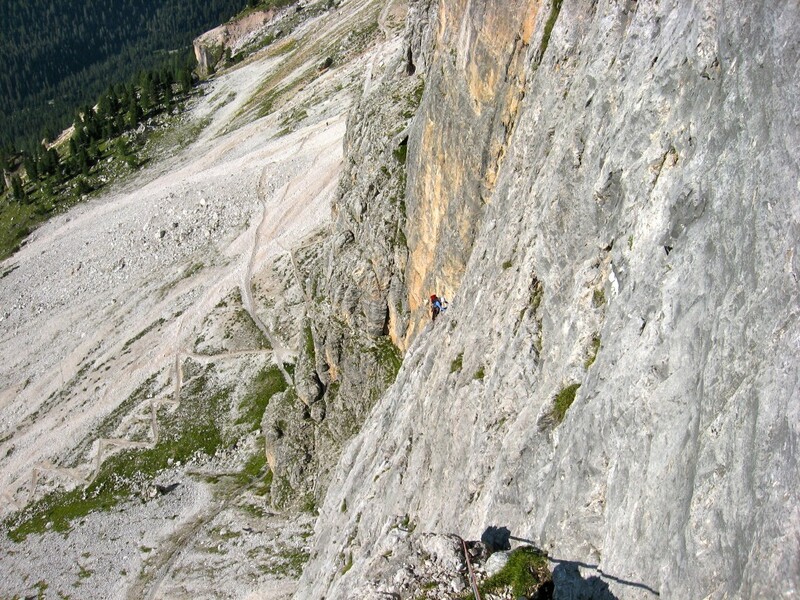 Yellow overhang near the top of the Pillar Rib route (pitch 14; Aug. 2008). 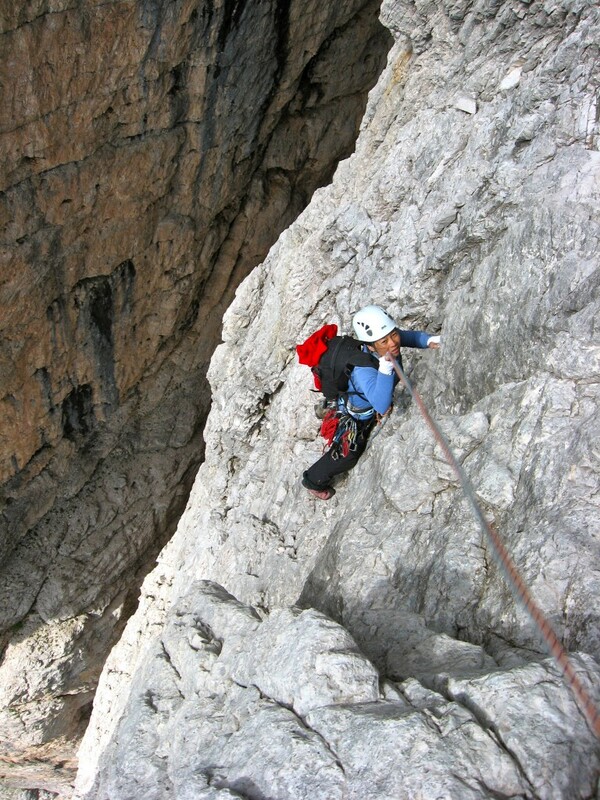 Shirley nearing the top of the Pillar Rib route on the Second Buttress of Tofana Di Rozes (Aug. 2008). 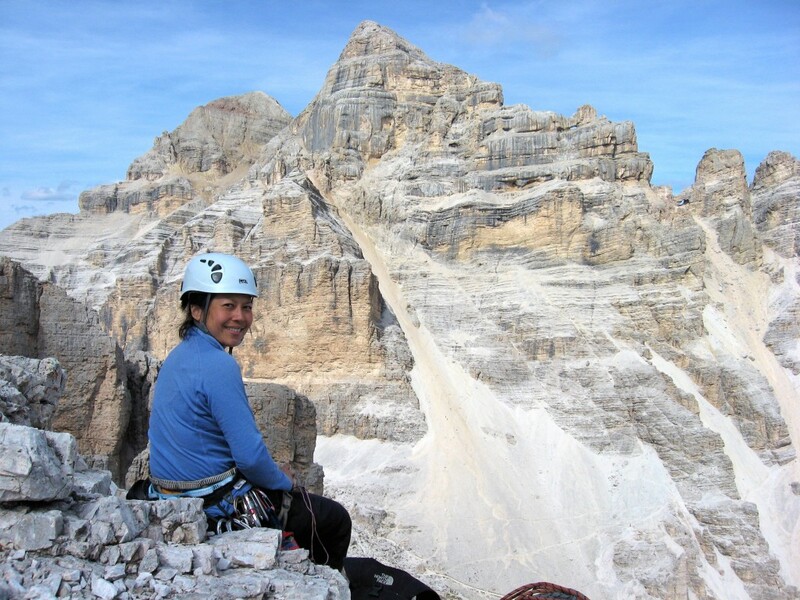 Shirley on the summit of Buttress Two of Tofana Di Rozes (Aug. 2008). 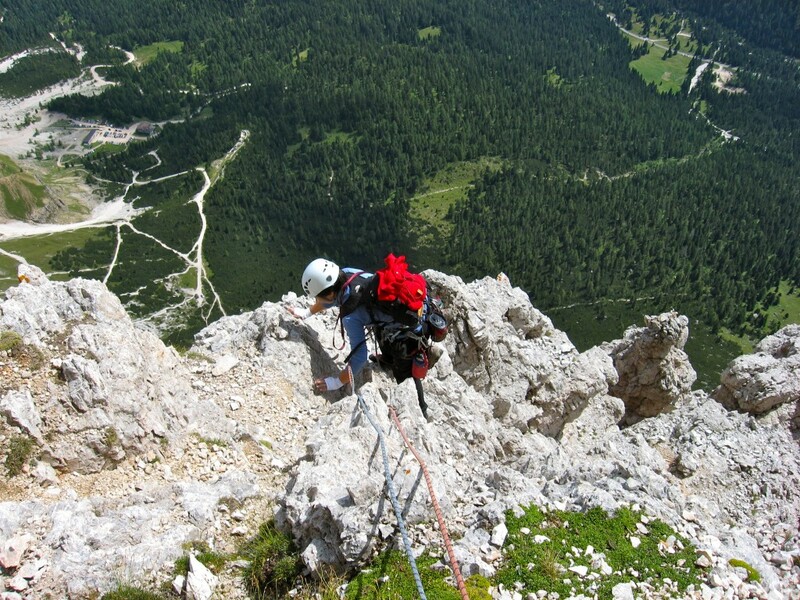 Shirley starting the descent from the top of Buttress Two on Tofana (Aug. 2008). 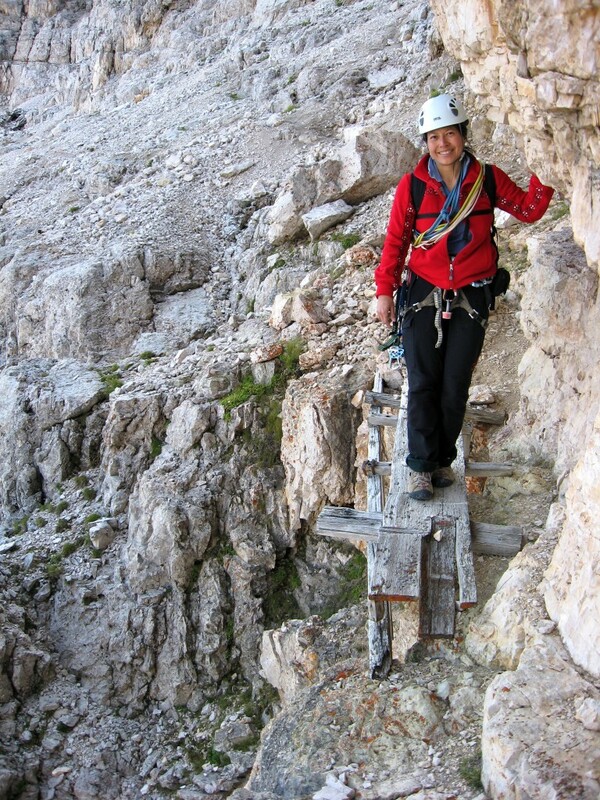 A nice solid bridge we encountered on the hike down …Shirley said it was solid & that I should go first (Aug. 2008). 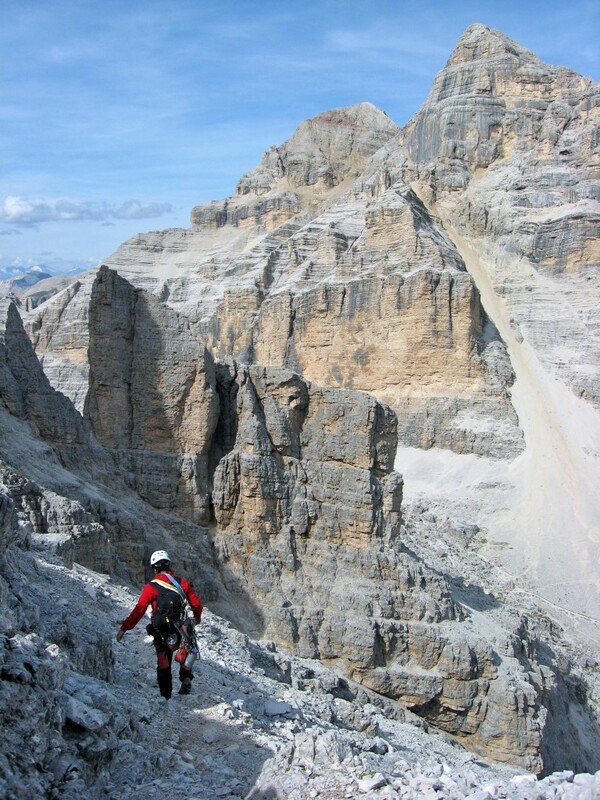 Descending the backside of Tofana’s Buttress Two (Aug. 2008). 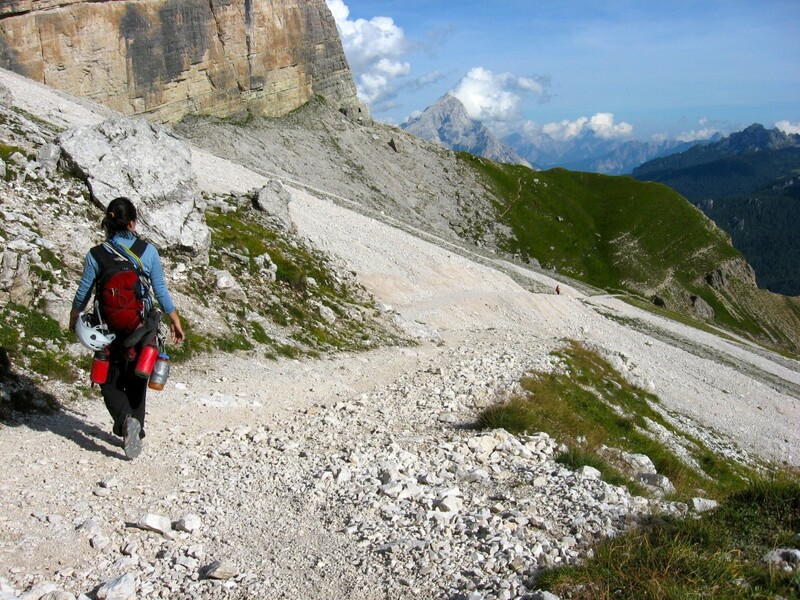 Almost down to the hiking trail (Aug. 2008). Shirley rushing back down to Rifugio Dibona hoping to catch dinner (we did! Aug. 2008).